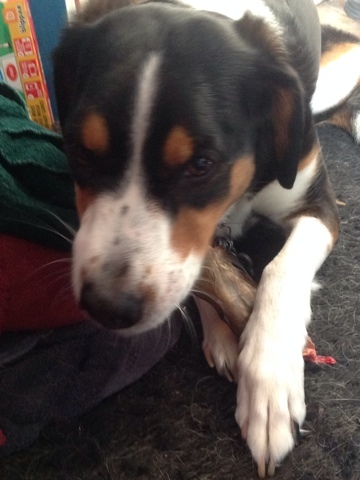 Cassandra: Dog Blog: You Want Me To Eat What? Dog Blog: You Want Me To Eat What? Mumma gave me a beef ear. It came in my last PetBox. It's an actual dried ear of a cow. Poor thing is probably walking around with the other cows asking why everyone isn't moo-ing anymore and can't hear their responses. It's hard and sorta textured funny like it used to have hair on it. That makes it weird to lick, but also weird to chew, and I dunno, am I supposed to eat it? I've done a little bit of all three so far, and then I stop and stare at it for awhile. Mumma thinks this is funny and keeps giggling at me. She refused to touch it at first and so I didn't want to touch it either and she had to coax me into to. I know the command "eat" as this means mumma wants me to chow down on whatever is being offered, and I'm darn good at that one, trust me. But "eat" this? Am I really supposed to? Guess I'll give it the old college try, eh?. You know, after all, it really is sorta tasty... Mmmm... Who knew? Mumma says tomorrow I can have the antler, whatever that is. We used to get BarkBox too, but mumma hasn't renewed our subscription. 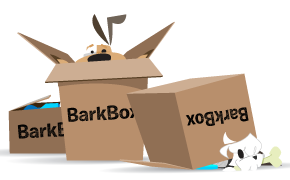 Want to try BarkBox? Use this link, and we'll both get a free box!